Astonishing. Regal. Awe-inspiring. Some of the adjectives that came to me as we summited the Acropolis. Even in their damaged, deteriorated states, the temples are extraordinary. As you stand on the Acropolis, the whole of Athens spreads out before you. Miles and miles of soft, almost rosy white buildings stretch toward the mountains in one direction and the sea in the other, interrupted from time to time by mountains of stone. It is not difficult to imagine why the Athenians thought their gods would be happy here. I thought of the great minds born of this civilization: Socrates, Plato, Aristotle, Euclid, Archimedes, Pythagoras... Philosophy, math, and science made great strides here, and we feel their influence still. I do not know why the first monastics came to Meteora. Had they heard tell of it in far off places? Did they wander into the wilderness and happen upon it? I do not know why they came, but I think I know why they stayed. It is impossible to escape the Godness of this place. The grandeur of the great stone monoliths that rise majestically from the rolling hills and meadows is positively breathtaking. The very air seems saturated with their resonance. A silence and awe enters the body with every breath. The first brave inhabitants scaled sheer cliff faces and made their dwellings in the clefts and caves high above the valley floor. Here they found the silence and the continual Presence their hearts yearned for. In the thirteenth century construction began on the first of the monasteries to wrap itself around the top of one of these great pillars of stone. Today the cliff top monasteries compose the second largest monastic community in the world, second only to Mount Athos. As we climbed hundreds of steps to the ascent, I imagined the rope ladders and pulleys that once offered the only method of conveyance. The structures have been marvelously integrated into the stone. In places, pieces of the mountain insert themselves into a room or porch. In others, a cellar tunnels into the rock. The stone and timber construction appears to have almost grown from the mountain. There is a humble and hearty elegance in the crafting of each fixture, each corridor, each arch. No pretention, just a solid loveliness. Iron candlesticks and chandeliers, arched doorways, earthenware oil jars, great wooden kegs, woven baskets and wine jugs, and wooden tools and implements, worn and much repaired, speak of a life of work and of simple beauty. As we meandered up and down stairs, in and out of corridors, we moved easily from indoors to out of doors as though one scarcely differed from the other. Excepting one thing. Every outdoor space astonished with a new vista; neighboring communities atop stone pillars, miles of bucolic countryside, far-off mountains of purple almost perpetually wrapped in mist, and blue sky that seemed to be beside me as much as above me. At Great Meteora, we visited the old church, no longer in use. Candles still burn before the icons. And the smell of incense, embedded in the old wood, whispered to me of holiness. Ancient frescoes covered the ceiling, columns, and walls. Stories without words. One of the things that my kids found most compelling was the collection of skulls and bones, remains of former inhabitants. I confess, it has messed with me a bit. I confidently explained to them that the monks preserved these as a reminder that death is very close to each of us, and is an essential part of our reality. But, I can't stop asking myself what that means to me. So far, myself hasn't answered. I realized I was holding my breath as I crossed the threshold of the Narthex. So long had I dreamed of coming to this place of story, of faith, of extravagance. What if you could build the Kingdom of Heaven? What would it look like? My eyes were immediately drawn to the image above the main door: Christ Pantocrator, "All Mighty". Huge slabs of wood set in elaborately carved marble frames stood between the Narthex and the interior of the temple. These would admit the faithful, but provide a barrior of safety or the Catechumens who had not yet been Chrismated. As I looked at the thousands of golden tiles in the vaulted ceiling, and the various colors and patterns of marble that formed the walls, I was grateful to know that Justinian had provided for the Catechumans a taste of the delights that awaited them. When Orthodox enter the Divine Liturgy, we step outside of Chronos time into Kairos time. The eternal NOW. And for a space, we are in the Kingdom of Heaven. It happens every Sunday, in small and great parishes, all over the world. LIGHT. It is the first thing I remember. Thousands of lights suspended in heavy iron chandeliers that appeared to float above my head. Sharp shafts of sunlight that plunged from windows in the dome to the floor below. I imagined curls of incense climbing those shafts of light. "Let my prayer arise in Thy sight as incense." What, after all, is the relationship beatween beauty and worship? Does it matter? I was assaulted by a thousand images clamoring for my attention. For a while, I simply exhulted in the extravagance...the images banging around in my head like echoes. And then...certain images became clarified in my vision, as if a hand had turned my face to say, "See this." Sometimes the hand belonged to one of my children. Four cherubim fly above the pillars which support the enormous dome. When Hagia Sophia was tragically corrupted following the Turkish invasion, the faces of these were covered with medallions. One of the cherubim has been completely restored and now flies magestically above the heads of those who walk there. In the half-dome directly above the altar is one of the most famous images of the Theotokos (Mother of God) in the world. I had bought an icon of her just the day before. I stood before her, reciting prayers about tenderness and compassion, traits which she understands so well. I allowed myself a moment to appraise the building with a purely artistic eye, considering columns, ribs, vaults, color... I quickly realized that, for me, it was impossible to separate the extraordinary beauty of this place with the faith which had given her birth. We climbed the stone ramp to the balcony. The smooth, worn stones gave testimony to the many who had climbed this way before us. I wish I knew more about how this balcony area was used. 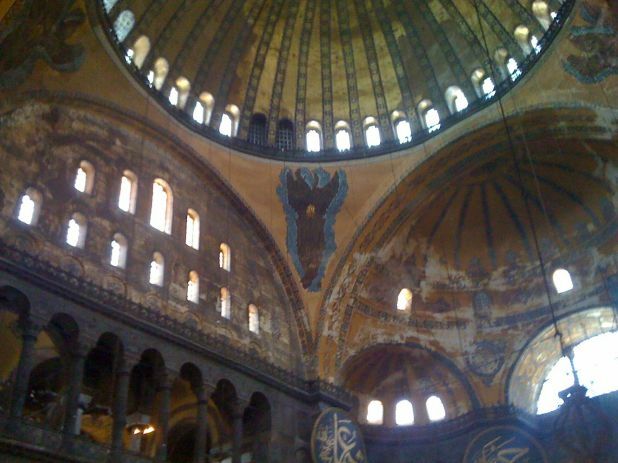 It houses some of the most significant mosaics/icons in Christendom. The most striking for me was The Last Judgement. It was the eyes that captivated me. In The Last Judgement, Christ is seated in the center with His mother on His right and John the Baptist on His left. Their eyes convey an unbelievable weightiness and sadness. My own eyes filled with tears as I considered them. So much they have done to rescue us from ourselves. So often we have chosen our own way, even if it meant our own destruction. No words. Just images. But a deep, profound story in those eyes. The Grand Bazaar is a cacaphony of chaos. Hundreds of people jostle one another from stand to stand. Huskers call out to passersby, "My turn. You come here. I show you. Not too much. You can do it." Kilim rug salesman are the most relentless. We navigate our way throught the labyrinthine corridors to purchase a magic lamp (genie included. No charge), tapestry icons, and Turkish delight. My favorite shops are the ones selling brilliant, jewel colored lamps. They fall from the ceiling in supple, sinewy lines, clamoring for attention. The marvelous irony is that each one makes the one next to it more beautiful, more luscious. It's the contrast; the extravagance of color that takes my breath away. No single lamp could do that alone. I am mesmerized. And I realize that the memory of that shop, vibrating with glorious light, is worth far more than owning any one of those lamps. Our first glimpse of Istanbul was spellbinding. A golden sea tethered to a turbulent sky by threads of sunlight, and a thousand slender minarets thrusting skyward all over the city. We drove across the shimmering Bosphorus, dotted with fishing boats; men who pull their living from the sea. The call to prayer sounded like a call and response as the nearest muezzin was answered in the silences by the echoes of his brothers further away. Our apartment sat halfway up a treacherous incline on a winding street. Geraniums and ivy crowded the entrance to our ancient building. We visited the Blue Mosque just before mid-day prayers. It is an imposing structure. The many domes and minarets are striking from a distance. To enter, we had to remove our shoes and Kelsey and I had to cover our hair. If we had been Muslims coming to pray, we would have also washed our faces, hands, and feet in the Sadirvan outside. I was struck by the sense of reverence this must inspire. Inside is a festival of colored tiles and swirling caligraphy. Domes and arches draw the eye skyward. The gilded mihrab in the center of the kibla wall invites the faithful to imagine they are looking into the gate oh paradise. I find myself thinking of the faithful who come here every day; who orchestrate their lives around the five pillars. And I remember Jesus speaking to another ardent, sincere, faithful one, "You are not far from the Kingdom." Priorities. Each of us has only so much money and so much time. Early in our marriage, Mike and I decided that we would always choose memories and experiences over stuff when deciding how to allocate money. At the time, he was fresh out of college and I was still in, so it was mostly a theoretical discussion. :) As children entered the picture, we held even more firmly to our credo. Because we are both gypsies at heart and, not surprisingly, so are our children, we have placed a high priority on travel. Sometimes that has meant piling in the car with sleeping bags and a tent to camp. Sometimes a trip to the beach. But, every now and then, it has meant a passport and a plane. Traveling internationally has given us a more realistic perspective about the world and where we fit in it. It has given us moments of surprise, and wonder, and laughter. It has provided a whole treasure trove of memories and stories that make sense only to the five of us. It has also asked a lot of us, as individuals and a family, and this has strengthened us, as individuals and as a family. In two days, we hit the road again. I am a jumble of joyous anticipation and abject terror. I feel like I have a multiple personality disorder. I am thrilled by the prospect, but overwhelmed by the last minute details that MUST be attended to. I collapsed into bed at 9:30 last night (a combined post-marathon/pre-travel exhaustion) but woke up at 3:00 with my mind whirring. Once I am on the plane, I will be fine. But, encounter me over the next couple of days at your own risk. I will be twittering and blogging, albeit sporadically. Most blogging will be done on my phone, so I apologize in advance for grammatical/spelling errors. It's pretty difficult to fix them on there. Also, if I include a photo, it could be anywhere in the post. Still working on figuring that out. We will be using our phones only as internet devices, so if you need to communicate with me, email, dm, or facebook message me. Here's a sneak peak at where we are going, for those of you who are into that sort of thing. Au revoir, mes amis! A bientôt!!! My least favorite part of any race is the hour or two just before it starts. I have an idea it's a little like being a soldier between engagements. My whole body is tense and ready for action, but there is no action. There is just waiting. Waiting for the shuttle to the start. Waiting in line for that all important last trip to the bathroom. Waiting to turn in my check gear. Waiting at the start. When the running starts, everything is alright. This I know. This is familiar. I am home. I let the crowd carry me for the first mile or so, not jockeying for position, just riding the great current. Then my body settles into the rhythm it knows and I begin to look around me to see what this run will be..
On Sunday, the place was the Pocono Mountains of Pennsylvania. The day was clean and clear and cool. About a thousand of us toed up at the start. We ran through leafy green trees and tiny townships. We passed beautiful old stone houses, clapboard general stores, dark, hidden ponds, a valley filled with a profusion of purple phlox and moss covered stones. People lined the course to encourage us and to thank us for running, (The run benefits their local Red Cross.) and little children gave us high fives. Mike and I stayed together for most of the first half. We gloried in the beauty around us and groaned about the grueling uphills. There were a great many more of these than we anticipated. Mike had missed some training near the end because of a couple of softball injuries, so when he knew he couldn't keep the pace I was shooting for, he graciously sent me on ahead. I was at 1:58 when I crossed the half-way point, beating my previous best half-marathon time by one minute. I was running a 9 minute pace, but I knew I would have to stay very near that to make my goal of 4 hours. It was not going to be easy. I was already tired. I ran the next 5 or 6 miles without knowing how fast or slow I was going. I just stayed in my rhythm and drank in the beauty around me, as the Great Doxology sang itself in my head. I had a number of interesting conversations with fellow runners as our cadences converged. We talked about other runs. One guy had done the Great Wall of China Marathon, one of my dream runs. That was pretty fascinating. Another told me about the Wine Glass Marathon which Mike and I have considered for the fall. Around mile 18 I asked the Great Wall of China guy how fast he was going. Just under 9 minutes. Perfect!! We stayed within sight of one another for the next 5 miles. And when last I saw him at mile 23 I was still running 9 minute miles. And then the flu set in. If you are an endurance athlete, you know what I mean. There is a point at which your body is beginning to eat itself. It has had to resort to a method of energy production that is less efficient. It dumps more lactate in the blood than your body can get rid of. The outward result of this is that you feel like you have the flu. My face was cold, my body was achy, my skin was cold and clammy, and I really, really wanted to throw up. Three miles lay between me and my goal. Three miles and a lot of lactate. My goal at this point became continuous forward motion. Shortly after I passed the 25 mile marker, one of the well-wishers on the side of the street said, "You still have 7 minutes to beat 4 hours!" This was torturous!! My poor brain, which was no longer working on all 8 cylinders, began furiously trying to decipher this information. How far past 25 miles was I? Half a mile? 100 yards? I had no idea. I dug deep and pushed myself to pick up my pace. I think. It felt faster. I'm pretty sure it was faster. We ran the last .2 miles on the gravel track of a high school stadium. The gravel felt like quicksand. My feet were so heavy. I pushed and pushed and wanted to cry. I could see the finish line but it was SO FAR AWAY. I couldn't see the clock until I rounded the turn and made my final approach. Four hours, one minute and change. The second clock ticked 59 as I crossed the finish. The Boston Marathon grants a 59 second grace period. This means that though my official qualifying time for 2011 will be 4:00 I could actually qualify with a 4:00:59. You do the math. All I could feel was joy! I had found a place inside me I did not know was there. And I had come freakishly close to doing something I secretly believed impossible. Every time I had told someone I wanted to qualify for Boston, I felt like I needed to apologize. I felt like an IMPOSTER. Not any more. I now knew it was not unreasonable to want this...to pursue it. I know, too, that I gave everything I had. I have no regrets. Nothing that was under my control would I have done differently. I leave for Europe on Saturday morning and will be gone just over a month. I will not train while I am gone. I am giving my body a much deserved break. Of course, we will be walking. A lot. But I need a break from the intensity. Training resumes in July with an eye toward the fall. We'll see what happens then. *I borrow the title from C.S. Lewis, of course. it seemed appropriate. It was a simple question. No malice or accusation. Just curiosity. She was a new massage therapist. I saw her because I had a coupon. She asked if anything was hurting or if I was just there for relaxation. I told her I was there to get everything loosened up because I was running a marathon on Sunday. That's when she asked me, "Why do you do it? Do marathons, I mean." I do it because I love to run. I love the training runs as much as the events. Running is solitude, silence, moving meditation. It is beauty and fragrance and music. It is weather, water, and earth. It roots me and gives me wings. I do it because it makes me strong...physically, mentally, spiritually. It teaches me about myself. Not all of it is pretty, but all of it is true. It teaches me to do things that are too hard for me. I do it because I am addicted to the miracle of it. Sometimes I look down at my feet and can't believe they are still moving after 18-20 miles. It is still a WONDER to me. EVERY time. He might give me the gift of a Boston qualifying time. That's what I asked for. :) But I was sick and missed several weeks of training. And I have arrived here with some physical challenges that make it seem unlikely. But sometimes those are the situations He likes best. "...to show that this all-surpassing gift is from God, and not from us..." So, just for the record, I will take it. And I will be deliriously happy about it. And, I will see it for the grace it is. He might give me joy. Joy in the breathing and the birds. Joy in my surroundings and my companions. Joy in the strength of my legs and the beating of my heart. This is the gift He gives me most often. It's our special thing. But, He might choose for me devastating defeat. Injury, sickness, fatigue. I've NEVER asked for that gift. But I have received it. Not in a marathon. Not yet. But in life. The thing is, I've seen what He does with moments like those. If this is what He has for me, I will unwrap it and pull it on. I may scream and rant. I may weep. Then, I will crawl up in His lap and ask Him to help me see the grace in this. This is life in technicolor. This is a life of fury and flame, of Presence and peace. This, Uniqua, is why I run. I had butterflies in my stomach as I pulled into the parking lot. When was the last time I had butterflies upon entering a museum? At the Ufizzi? The Louvre? I had been eagerly anticipating the arrival of the Chihuly exhibit since I read about it last fall. And now, it was here. Just on the other side of that wall. And my stomach was all in turmoil. Afraid...that it might not be as wonderful as I imagined. Afraid that it would, and that I would be mesmerized, transfixed, unable to move or speak and they would have to dust me like some fixture or piece of furniture. My heart pounded as I climbed the stairs. I was greeted by several Persians opening themselves from their perch on the wall. And I knew I was in no danger of being disappointed. The exhibit opens with selections from Chihuly's Ikebana collection. A single stem rises elegantly from a vase. A voluptuous blossom seems almost to float atop the stem. The artist draws his inspiration for this collection from the Japanese art of flower arranging; spare and uncluttered. The cut stems serve as "symbols of mortality and the fleeting nature of beauty". I walked all around them, watching how the light changed them from different angles, peering through the vase to find the stem standing in glittering particles I assume to be ground glass. Shortly after his graduation, Chihuly visited the Mecca of glass blowing, Murano, a tiny Venetian Island that eats, breathes, and sleeps glass. I have ridden the vaporetto out to Murano myself and understand the spell she can weave. His Venetian collection pays homage to the atmosphere, the essence of this captivating city. Rich, deep, earthy colors brushed with copper and gold; slender, undulating vines wrapped round cylindrical or bulbous forms; and a fascinating interplay of whimsy and grandeur characterize the works. Delicate, transparent, fragile, fluid. These are some of the words that most immediately came to mind when I viewed the lovely Seaforms. Chihuly describes the process used to make these as "intuitive...with an inherent fluidity". Certainly, the forms are organic and not in the least contrived. But they definitely hint at transcendence. They speak to me of little girls in organza, tea parties, rose water, snow, and stars... The pieces lie over, around and within one another creating an endless variety of configurations, and building layers of opacity. When I turned to enter the next room, I was astonished. I felt a bit as though I were entering a sublimely exquisite reconfiguration of Willy Wonka's Chocolate Factory. I was assaulted with a glorious, vibrant, pulsating, delirium of color. Kudos to the curator who decided to place the Persians so that they perfectly frame the Mille Fiori Garden in the next room, tantalizing, pulling you forward. And yet (Oh glorious tension!!) it is impossible to leave this room without lingering to wonder at the marvelous Macchias. Chihuly says the Macchias "began with me waking up one day wanting to use all three hundred colors in the hot shop." They are also characterized as an attempt to capture glass in its most volatile state--simultaneously hot and flowing, cool and congealing. The endless variety of configurations and colorations are captivating. The Persians which share this room are inspired by the exotic awe that early European explorers felt upon encountering the region for the first time. "I didn't do any research on the arts of ancient Persia. But the forms make me think of mystical, enchanted gardens and minarets." Me too, Mr. Chihuly. Me too. A continuously looping video shows how the magic happens in the hot shop. Herein you can see one of the most delightful aspects of the work. It is a completely synergistic, collaborative effort. Mr. Chihuly has assembled a talented group of glass artists to work with him. He trusts them. He gives them a rough idea of what he is after, then gives them freedom to bring their own voice into the work. Paintings in the first room show some of his idea boards. Many of them are created by squeezing paint directly from the tube. He says the liquid medium of the paint is well suited to designing for glass which is also a liquid medium. W hen I finally yielded to the siren call of the Mille Fiori garden (Italian for a thousand flowers), I was treated to a virtual garden of long, straight stems of purple, spiky blades of green, swirly undulating "vines", bulbous projections stubbornly clinging to the earth. All of this is displayed on a black reflective base meaning that there are actually two gardens. This was the only place I got in trouble. I was so mesmerized by the reflections, I got a little closer than the security guard liked. We made up though. It's all good. Chihuly acknowledges that he was influenced by his mother's flower gardens to create this series. However, he does not try to copy nature but to "replicate its processes and sensory effects." The exhibit concludes with Sea Blue and Green Tower, a whirling, swirling, Medusa like explosion of tendrils that rises from the floor to above my head. It was fun for me to look at all the variations he made on the theme. Some tendrils come to a fine, tapered point, others swell to a little bulb. Some are transparent, others more opaque. Some bear a crosshatching of diamonds, others long slender lines, others still have no adornment at all. This is, without a doubt, one of the most spectacular exhibits I have ever seen at the Frist Center. I plan to revisit it many times. I am looking forward to taking my kids back to see it. If you are in the Nashville area, you MUST check it out. It will be here til January. Cheekwood Botanical Garden and Art Museum will also be hosting Chihuly (in the gardens!!!) May 25th thru October 11th. Finally, Chihuly has designed the stage set for the Nashville Symphony's production of Bluebeard's Castle. Do yourself a favor and take in at least one of these exhibits. You will be glad you did. I remember the scent of her. A curious mix of line-dried cotton, strong percolator coffee, and Juicy Fruit gum. She wore her hair in a braided coil on the back of her head. I still recall the wonder of seeing it down for the first time...soft and wavy, hanging past her waist...dark when first I knew her, though nearly white in the end. In the twenty-seven years I knew her, I never, EVER saw her in pants. The dresses, she made herself, along with aprons stitched from flour sacks. I still have some of these. She was for me, in many ways, a link to a world that was nearly past. It was my great good fortune to grow up with my Grandma Howard just across the yard. I remember lying on the floor, enchanted, as I watched her work her beautiful old treadle sewing machine. My brother and I would play under her quilting frame until one of us stood up and bumped the quilt. Then we were promptly sent out of doors. Sometimes, she let me spend the night. Her crunchy corn-shuck mattress smelled of sunshine and earth. She had a magical cabinet with a mysterious dispenser of flour. It was a marvel to me. Her only vice, so far as I knew, was an occasional, discreet, dip of Bruton snuff, dispensed from a tiny, silver spoon. She loved Peonies and Cleome (Pole-cat weeds to her) and cedar Christmas trees. I will never forget watching her care for her bed-ridden, invalid mother-in-law. This woman had been a presence in her home almost since her wedding day. Although my grandfather died young, his mother stayed on. Caring for her in those final years was a smelly, exhausting, thankless job. But it would never have occurred to my grandma to do anything else. I hope I have inherited some of her loyalty and fortitude. To my mind, my Grandma Nelson, though only a few years her junior, belonged to another generation entirely. She wore the bouffant hair style so popular when I was a little girl, and fitted polyester dresses. She had been a working woman most of her adult life. She was a teacher at my elementary school. I remember one occasion when I got sick at school. It was she who sat in the nurse's office with me and put cold cloths on my head. She was also the one who tiptoed into my fourth grade classroom to whisper to me that I had a new baby brother. Grandma is one of those quintessential southern women who will always cook at least twice as much as the assembled throng could possibly eat. Her house is a repository of little bowls with tasty indulgences, the like of which would never be left sitting out in a house full of children. She has been one of the most indefatigable women I have ever known. She tilled their garden till she was in her early eighties. Her flower garden is blue and purple larkspur growing amongst poppies of apricot with purple throats; iris, lilies, and moss roses. Her kindness and generosity of spirit were not unknown to me. But, the reach of them has become intensely apparent over the two years since her stroke. I see it in the fact that at least one of her children has been with her every day for the past two years. I see it in the tender, respectful way that her attendants speak with her...the way people have surfaced from all phases of her life to visit with her. Because they love her. Because they KNOW she loves them. Even when she can't tell them. And I see it when my granddad can't resist holding her hand when they are near one another. She gave to me a tremendous gift. One for which I can never begin to repay her. She gave birth to MY MOMMY!. When I think of the most essential, most delightful parts of who I am, I find that all have a root in her. My mom opened to me the magical world of fairy tales and poetry. Even now I would rather hear a story in her voice than any other I know. I tormented her asking for the same stories and the same poems over and over and over again. Perhaps I would have found my love for literature without her, though I can hardly think how. Lazy afternoons spent listening to her make music dance from our old piano wove a spell over me that would carry me to places I could never imagine. All I knew then was that I wanted music to come from my fingers like it came from hers. She was my first piano teacher. She gave me entrance to a marvelous musical realm, the depths of which I will never exhaust. I used to tease her about her preoccupation with flowers. Mine was a childhood laced with beautiful blossoms and intoxicating fragrance, and she made it happen. I don't think I realized how very important it was to me until I lived in a home of my own. I could not bear the absence of my mother's gardens. So I planted. And I fussed. I weeded, and pruned, and very nearly wept from the sheer joy of it all. Hers is a life saturated in faith. Though our spiritual journeys have taken very different paths, she has been part of the reason I was compelled to journey at all...part of the reason I could never imagine a life without God. I hope that my parenting has been perfumed by hers. Certainly, I did not inherit her uncanny ability to walk into a room where my child has searched for a lost item for hours, only to open a drawer and find it lying on top. I assumed this was automatically part of being a parent. Apparently, it is not. But I hope I have some of her wisdom and her intuition. And, I hope my children will always be as sure of my love as I have always been of hers. Has she been scared? Absolutely! Did she have questions? Of course. But she is moving through this with a grace and resolve that astounds me. She is determined to know what is in this for her. She lives in constant gratitude for the many people who have given of themselves to bless her during this time. She still takes care of my grandmother, and she still looks for opportunities to serve and bless others. She has turned an absence of hair into a fashion show of hats and scarves (many of them gifts from loving friends). She refuses to indulge in self-pity. She refuses to blame. She refuses to despair. She chooses to LIVE. On this day, I am poignantly aware that God has been overly kind to me in allowing me to be loved, and nurtured, and instructed by these three extraordinary women. I am learning from them still. To my lovely grandmothers, one here and one already tasting the joy of eternity, thank you for loving me well. And to my precious, priceless mother, I love you more than I can say. My gratitude to you is immense. You are my hero. I have lived most of my life inside a bubble. It was invisible. If you bumped into it, you wouldn't know. But I would. And I would make sure you did not get inside. It's not that I don't like people. I find them endlessly fascinating, and have always had lots of friends. But I was convinced that my friends liked me for what I could give them; because I was a good listener; because I was dependable and did things for them. I was certain that if I ever showed them the dark places inside me...if I was ever at a place where I had nothing left to give...that they would tire of me and move on. So I reinforced the walls of my bubble. I lied to my friends when they asked me how I was doing. I created a persona for myself that looked like she had it all together. I determined to work out whatever I was wrestling with on my own. I was a fool! Then God did something unbelievably kind for me. It did not feel kind. It felt brutal. He let me crash. He allowed me to find myself sprawled out on the floor with no resources. Completely devastated. It was grace, though I did not see it yet. I no longer had the stamina to pretend. In my desperation, without ever really deciding to do it, I blubbered my story to a friend. My bubble was compromised. I was ready for her to tell me she found me despicable and that she wanted nothing to do with me. She didn't. She grieved with me, and loved me. She made it safe to be me. ALL of me. Over the past couple of years, I have invited a handful of friends inside my bubble. Not everyone gets to come inside. Not everyone needs to. But I have discovered the gift of having friends who know all of me. They tell me when I am being foolish. Believe me, I need that. They challenge me to do things that seem impossible. And when I fail...when I struggle...they love me, bandage my wounds, and refuse to let me despair. To my dearly loved bosom friends, you know who you are, thank you!! Thank you for loving me all the time, no matter what. Thank you for being willing to speak truth to me, even when I don't want to hear it. Thank you for believing in me when I don't believe in myself. Thank you for trusting me with YOUR story. I promise to always hold it as the fragile, precious treasure that it is. Thank you for teaching me so much. Thank you for praying with me and for me. Thank you for making me better than I am. I never, EVER want to try and live life without you again. How about you? Who gets to come inside your bubble?